The day has finally arrived. You worked hard and now the time has come to mellow out for a bit. You’ve packed your bags and you’re ready to embark on a new travel adventure. Upon choosing a dream travel destination, you also had to take care of your accommodation. Whether you’re travelling to a place that you can later write a successful travel blog about or for pure pleasure, accommodation is definitely one of the most important factors that contributes to a fully satisfying vacation. Having a strong website is an excellent way for every hotel and resort out there to showcase their offer to potential guests. A website can help them drive bookings as well as revenue, and also set them apart from competition. 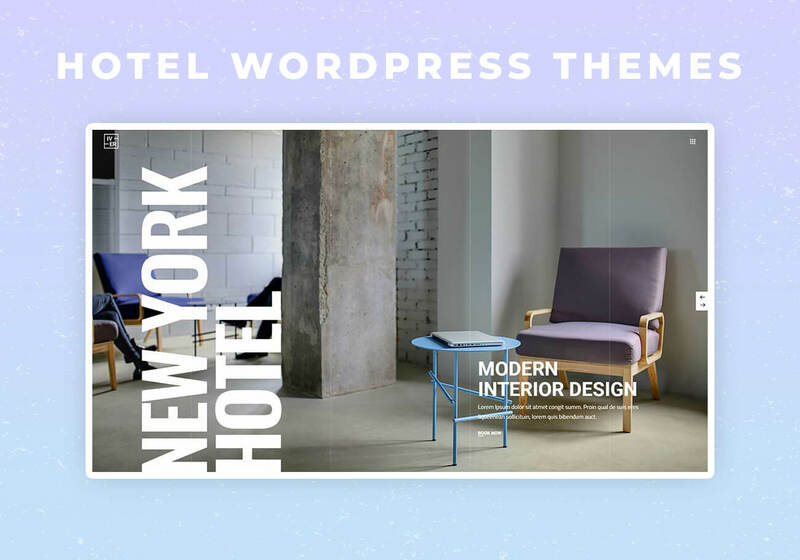 There’s a plethora of themes to choose from, but we’ve narrowed it all down to 5 best hotel WordPress themes. Iver is nothing short of a completely modern, fully responsive and entirely customizable hotel theme. It comes with a collection of 6 predesigned homepage layouts, all of which you can alter to fit your needs. The theme is designed in a bold manner and is sure to amaze the visitors. What we especially liked was the fact that there’s a reservation form on literally every single page. This means that your visitors can easily book rooms directly on site, without having to look for the form elsewhere. How handy is that?! The theme also includes the fullscreen layout that we were truly impressed by. It allows you to create stunning showcases and practically immerse the visitors in the local atmosphere! You can also add short descriptions to every slide, in order to provide your guests with some extra details. Iver furthermore packs an impressive set of ready-made room templates, which allow you to perfectly show off rooms to the visitors. Regarding modernly designed room lists, guests can set various filters, and also use multiple criteria. That way they can list rooms either by date, by price (from high to low and vice versa), and by name. It’s also super easy to check room availability, simply insert the desired dates! As for room singles, you get to not only add descriptions, but also include location and reviews. It’s also super useful to list all amenities as well as extra services you may offer. That way your guests can more easily decide to proceed with the booking which they can complete directly on the page! All it takes to make a reservation is just one mouse click! We also liked the fact that Iver includes a collection of striking shop pages, so you can set up your online store in a flash. Not many hotel themes come with shop layouts this enchanting so that’s another feature that sets Iver apart from the competition. If you’re in quest of finding a theme that will help you put your hotel in the spotlight, than Iver should definitely be your choice #1! This contemporary theme comes with literally all the functionalities any accommodation may need! It truly empowers you to build a website that will both look and feel amazing for your users regardless of the device they view it on. When we tried this theme little did we know that we’d be in for a real treat! The authors of FiveStar have made something that will ensure a truly stellar website building experience for everyone. The theme includes a set of 6 predesigned homepages, and each has been made for a specific accommodation type. There are home layouts for every luxury hotel, bed & breakfast, city tourism, tropical, ski and nature resort. Every page enables you to showcase what your offer in an impeccable fashion. You can add testimonials, further introduce your team, add background videos, and so much more. The templates are packed with features that are perfectly appropriate for the type of resort they’re intended for. We especially liked the fact that on the Bed and Breakfast layout you can insert info that regards transportation. This is really useful as it means your guests will be able to reach you with ease. What’s also great about FiveStar is that not only it was impeccably designed, but it’s also fully customizable. This means that you can modify both home and inner pages exactly to fit your taste. You can also tweak Google Maps,depending on your preferences. Throughout entire theme you’ll notice a bunch of impressive elements, such as the amazing parallax sections. This feature is sure to make scrolling more enjoyable and fun for your users! Reservations can be completed on the spot! Once they find the accommodation they like, guests can make bookings in just a few clicks. As regards shortcodes, FiveStar packs an astounding collection specifically made for the accommodation industry. Not only does it feature hotel-specific shortcodes, but also shortocdes and widgets which are great for presentational purposes. The Image Gallery widget, Expanded Gallery and Stacked Images are just some of the powerful widgets and shortcodes that come with the theme. You can showcase your accommodation and create mesmerizing galleries that will surely captivate the visitors and get you more bookings! Albergo is a true gem among hotel and accommodation themes. From the very first glance you can tell that this is a terrific theme designed in an entirely modern fashion. It includes an assortment of 8 homepages, each highly malleable, that you can adapt to fit your requirements. We were impressed from the very start, as the main home comes with the amazing parallax effect that takes up most of the page. Every homepage has been meticulously designed in an elegant manner. There are no excess details, but practical elements that help you show off your accommodation in an all-encompassing fashion. What also caught our eye were animations used on these layouts that make scrolling all the more fun! For instance, on Summer Resort template you’ll notice that smaller images on the right side of the page move up and down while you scroll. This surely adds to creating a fun browsing experience for your visitors. Albergo also comes with a collection of four types of room lists, each aesthetically pleasing. You can use them to showcase what accommodation you have to offer in a truly stylish way! To present your rooms in greater detail, you have Albergo’s voguish room single template. By adding more images and by highlighting what each room has to offer, you’ll help visitors easily make their decision! We liked the fact that there’s an option to include the exact location on room singles as well as reviews. This means that there’s no way anyone will get lost, plus it helps to see what other guests thought of a certain accommodation! This theme packs an impressive portfolio assortment as well as a wide variety of inner pages. The authors have clearly thought it through as to how to satisfy everyone’s taste. One of the things that prove it, for example, is the option to choose between light and dark contact form. Visitors can make bookings in just a few clicks, as the reservation system comes entirely intuitive. You can also set up your online shop with ease, and blog like a true star. Feel free to check out what Blog Masonry in Grid page looks like. Here you can list all the posts you wrote, but in such a lovely manner. Just look how wonderfully animated images above posts are! From luxury hotels to hostels, camping, summer resorts, and more, Albergo is unquestionably an excellent choice for making your website. Nowadays, it’s basically impossible to make it in any business without an impressive website. For anyone in the accommodation industry, Hotel Luxe might be just the thing you need to make it big. The theme is fully customizable and it comes with 6 homepages, numerous sliders and header variations. Choose and combine elements the way you like it best to create a website exactly up to your taste. It appears that the theme is intended for higher-end hotels, but there are homepages for bed & breakfast as well as for motels. To win the crowd over and make them book your accommodation, the authors have enabled you to upload not only images but also background videos. This is an excellent way to showcase what you have to offer and what sets you apart from the rest. As regards the booking system, guests can make reservations directly on site. We’d like to point out the fact that this theme features four payment methods – offline payment, authorize.net, PayPal, and Stripe. It’s great to offer your guests diverse ways in which they can settle a payment, they’ll surely appreciate it! As its name suggests, this theme was designed in a luxurious manner. With its astonishing home and inner pages you can create in-depth presentations of your establishment. When you have a special offer for your clientele, Hotel Luxe enables you to add a counter to your page. Let everyone know until when exactly they can book rooms and also save money in the process! Hotel Luxe is definitely an appealing theme to look at and it’ll leave a lasting impression on your visitors. It’s got all you need to set up a fully functional website and to highlight what makes your accommodation stand out in this competitive market. Welcome to Bellevue, a terrific theme that is ideal for your hotel, bed & breakfast, vacation rentals, and far more! It is stacked full with niche-specific functionalities that’ll help you craft a professional website with utmost ease. There are 8 malleable homepages to choose from and each can be tweaked depending on your needs. We must say that we especially liked the One Page template. It’s great because it enables you to provide your visitors with everything they need to know about your hotel. At the very bottom of the page there’s the option to check the room availability and to book the accommodation. It goes without saying that all payments can be completed online. As other hotel themes, Bellevue too enables you to showcase your rooms and to specify all the amenities you offer. The theme comes with a truly vast assortment of elements and shortcodes that are perfect for all accommodation businesses. The authors have even included some premium plugins free of charge. Bellevue features a custom version of WP Booking System that costs $34, as well as the Master Slider Pro ($22). If you’re impatient to launch the website but not everything’s ready yet, you can use the Coming Soon page. No need to bother with creating it on your own, as Bellevue packs even this layout. Visitors can leave their email address and get a notification when website launches. Terrific home and inner pages, stunning design, and a myriad of functionalities make Bellevue a spectacular theme. If you decide to purchase Bellevue, there’s no way you can go wrong with it! It’s time for your accommodation to steal the limelight!